Green Valley Homes offers a splendid view, unpolluted air, plenty of natural light with its innovative architecture and an array of amenities, just about everything you need to lead a secure life. Leave behind an over-worked life, the clutter and commotion of overcrowded cities. 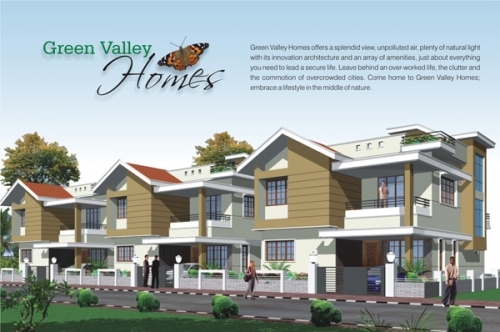 Come home to Green Valley Homes; Embrace a lifestyle in the middle of nature. Green Valley Homes is away from noisy city life that makes you tired with its maddening crowd, severe traffic congestion and pollution. Green Valley Homes is located amidst serene environs in Bajpe, Mangalore. A home, where you feel the view of open sky that soothes you and where mother nature caresses you. At Green Valley Homes we have taken these potentialities as prime priority to provide a green habitat for those who are in love with nature. * Acrylic Emulsion paint with Putty finish for interiors and acrylic exterior paint for exterior surface. This entry was posted in Property and tagged airport, apartments, Bajpe, green valley, homes, Mangalore. Bookmark the permalink.